Below is an excerpt from Elisha Goldstein, Ph.D.’s new book, Uncovering Happiness. Start by picking one of the undesirable habits that you’ve identified as fueling your depression loop. Take a moment to picture in your mind the routine as vividly as possible. What time does it occur? Where are you? Who are you with? The more real you can make it and the more detail you can imagine it with, the better. Next, pause before engaging with whatever the routine is. In this space of awareness, play with the possibility of doing something different. If it’s around food, imagine giving someone a call, taking a walk, or sitting in a short meditation practice. This may help uncover what the need really is in that moment. As you move through it, monitor your stress around it. On a scale of 1 to 10, how high is your urge to engage in this bad habit? The idea here is to play with this and see what your experience is. When the stress gets below a 7, and you begin to feel more comfortable in your imagination, you can bring it into real life. One of my students had a problem with obesity and felt completely helpless when she would drive by a particular bakery in Los Angeles. When we went through the process, she realized that eating cake in the bakery gave her a feeling of comfort, of being loved. This was her reward. We came up with another ritual of placing her hand on her heart or calling a friend as a means of receiving love and comfort. I asked her to quantify, on a scale of 1 to 10, how much she believes she’ll be able to do this. She said about a 2. She had every reason to believe she couldn’t do it, in the past, every time she drove by the bakery, her prefrontal cortex went off-line. Having her visualize driving near the bakery was a lot safer and could give her the experience of success. I asked her what she noticed after visualizing it, and she said, “As I knew I was getting near it, I felt my heart pumping. I gave myself what I needed: I placed my hand on my heart for comfort and just drove by the bakery. Now I feel more confident that I can do this; it’s almost like I’ve already done it.” Belief is the most powerful pill we can take. As you play with this, you can expect that from time to time you will have bad days where stress can get the best of you, and you find yourself falling into the same old bad habits. Here is a phrase that I use as one of my therapy strategies: Forgive and Invite. As best you can, forgive yourself for the past. There’s no value in spending time with those voices of self-judgment; it only steals your energy from moving forward. Now that you’re present, invite yourself to reconnect to your intention with the changes you’ve wanted to make. 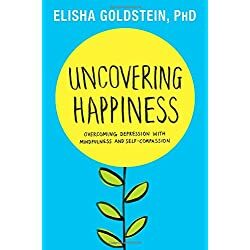 This is an excerpt from the new book, Uncovering Happiness by Psych Central blogger Elisha Goldstein, Ph.D. Please check out his new book on Amazon.com.